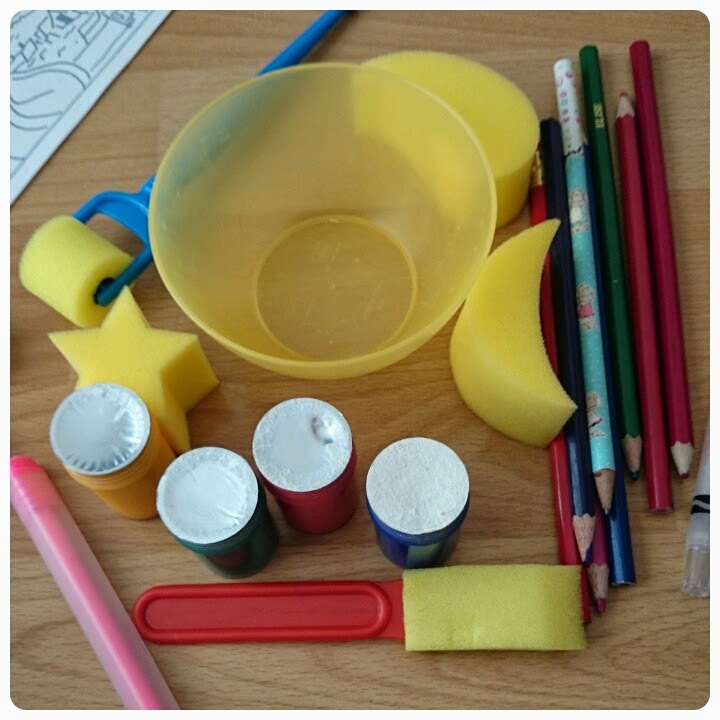 Last week the lovely people at Galt Toys were looking for parent bloggers with children between the ages of 5 and 12 to take part in a fun art challenge. The idea for the art challenge came from something that they did earlier in the year. Galt Toys asked the famous contemporary artist Ed Chapman to recreate Andy Warhol's Marilyn Monroe portrait using arts and crafts materials from Galt themselves and since then Galt Toys. Ed managed to show just would could be achieved using the right art supplies and of course a little bit of imagination. This ledd to Galt Toys launching their very own Mini Masterpiece series. 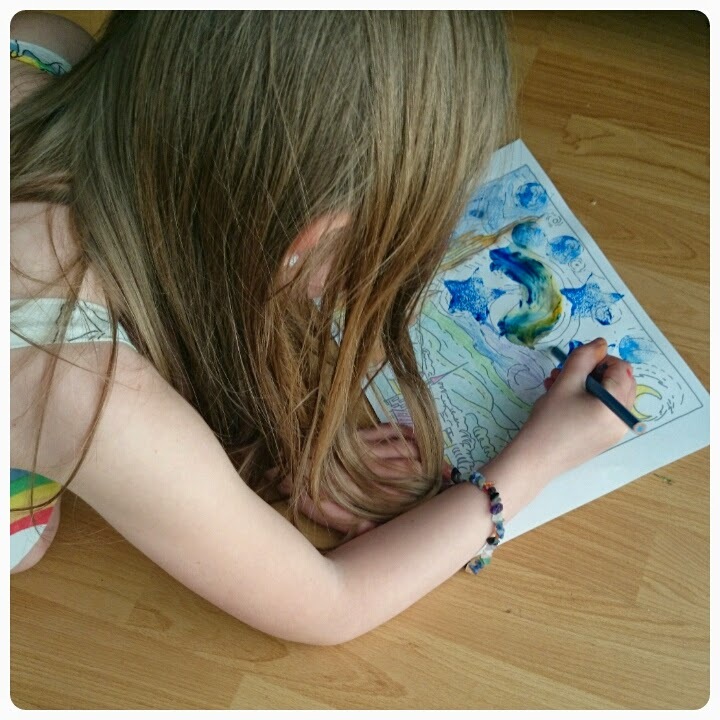 Using template from six famous works of art, Galt Toys decided that they want your children to print them out so that they can decorate them and create their very own mini masterpieces. Last month Galt toys shared with you a fantastic Monet piece of art, this could then be downloaded and printed out, giving children the chance to redesign this famous artwork and make it their own and by sharing it with Galt Toys, they were in the running to win a fantastic arts and crafts bundle worth £50. 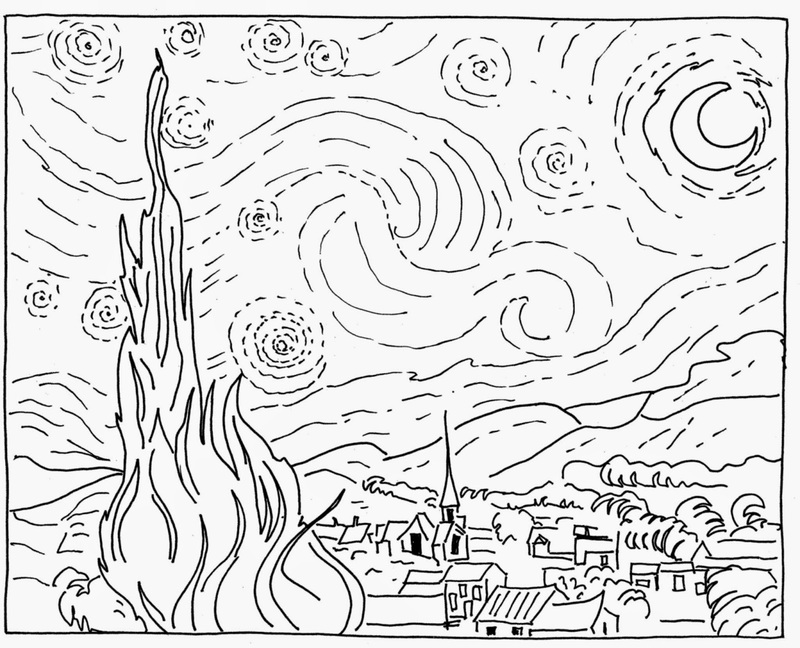 This month is the turn of Van Gogh's Starry Night. 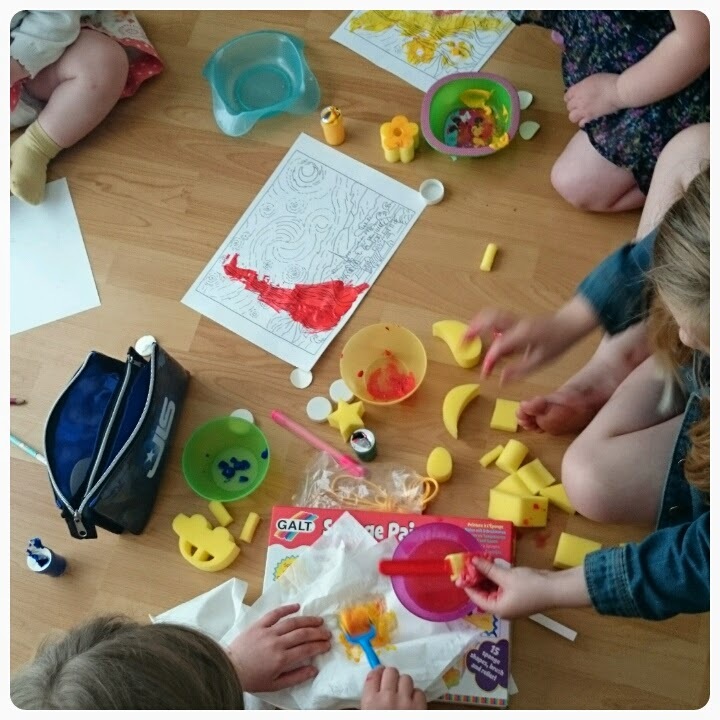 My children and I were lucky enough to be sent a Sponge Painting Box to help us with our creations. Download and print out the mini masterpiece on a white piece of paper. 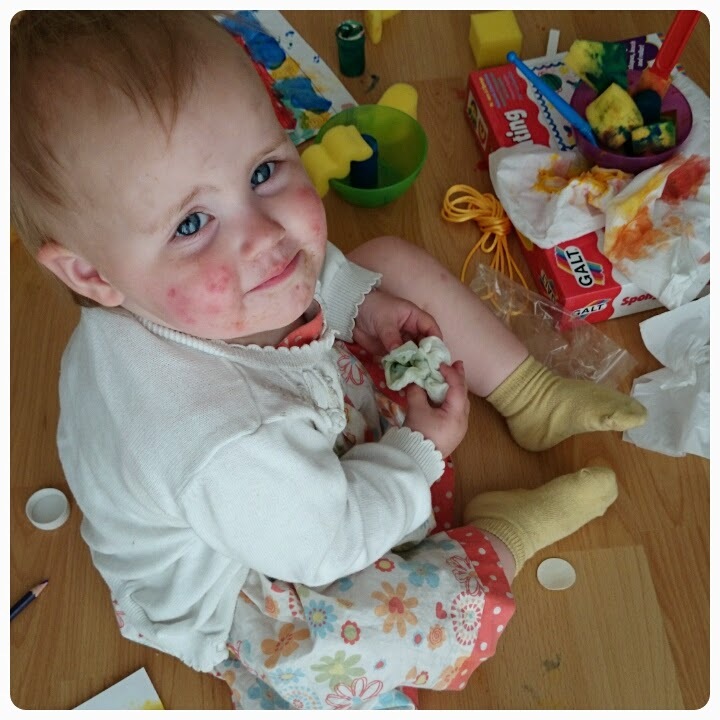 Decide which materials you want to use to hep create your masterpiece. My girls decided on a mixture of paints, pens, pencils and of course the sponge shapes and rollers provided in our painting box. I think the great thing about art is that is down to the individuals interpretation, so there are no rules when it comes to what colours to use, where to place certain objects, art should be fun and ultimately you are creating something unique. Even Layla managed to get in on the action. Leave your masterpiece on a clean service to dry. Now Gracie and Layla are too young to enter but here are the finished masterpieces from my eldest two daughters. Freya (6 years old) covered hers entirely in paint, using a good mixture of primary colours, highlighting the stars in the sky. Elise (8 years old) decided to go for a mixture of pencils and paints. Not going for the traditional yellow stars, definitely giving her own artistic impression of what a Starry Night should look like. Why not get your kids to give it a go and see what masterpieces they can create. Disclaimer : I was sent the sponge kit free of charge to help me take part in this challenge however all thoughts and opinions are my own. Fab pictures, what a lovely idea!